Most of the countries have some seasonal change in weather throughout the year, but generally the closer you are either to the north or the south pole, the stronger are the differences between seasons. Around the equator there is typically only two seasons, the dry season and the rainy season. New Zealand has full four seasons and as most travellers are coming from the northern hemisphere, the seasons would occur in almost opposite time of the year. For example Northern Europe would enjoy the summer season somewhere around between June and August, but in New Zealand the summer months are December, January and February. During summer months the average temperature ranges between 20-30 celcius (70-90 fahrenheit) in daytime and in winter months somewhere around 10-15 celcius (50-60 fahrenheit) degrees. Please note that daytime temperatures are significantly higher than nighttime and you should be prepared accordingly. The weather can change very fast in New Zealand, some might argue you can experience all four seasons within one single day. If you need to know the weather around New Zealand right now, you should check out the National Weather Service for New Zealand at http://www.metservice.com/national/home From metservice website you will up to date weather information, warnings and short-term forecasts as well. If you are going hiking on the mountains in winter season, you should be well aware of the current avalanche warnings. Follow up on that information at http://www.avalanche.net.nz/ and visit the local department of conservation offices for more details and expert opinion. Avalanches and landslides are a real danger in New Zealand and they do claim lives almost every year, so be prepared for those. Summer is the time for holidays, travelling, relaxing and New Zealand has certainly a lot of offer in that respect. Most locals use some of their annual holidays around December-January. If you coming from Europe or the USA, you will probably be surprised by the number of daylight hours in the summertime. In the summertime, it is normal to have sunlight till 9-10pm because New Zealand is relatively close to the south pole of the planet. If you live in the northern hemisphere and closers to the north pole, you would know the same is true in the June-August months of the year. Temperatures during summer months range from 20 to 30 Celcius degrees. The weather is perfect for all kinds of outdoor activities such as having a picnic on the beach and travel following the beautiful coastline. Summer is also a great time to embark on one of the Great Walks which typically take about 2-5 days depending on the distance covered. If you are coming as a tourist, please be aware that accommodation options get generally booked well in advance and smaller towns have very limited options. Because of the clean environment, the UV effect of the sun is very strong. You should cover yourself appropriately or use sunscreen especially if you are doing any outdoor activities with little shelter. The ultraviolet radiation varies throughout seasons and time of the day. The strongest time for the UV radiation is from 11 am till 3 pm. 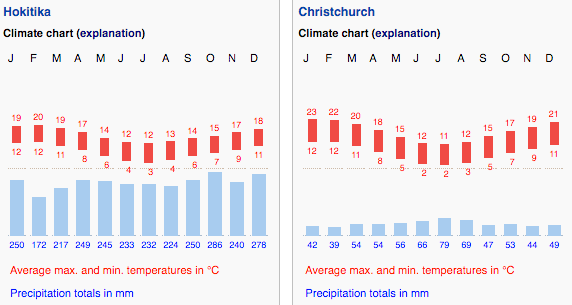 Summer is when New Zealand gets generally more rain than in wintertime. That being said, it rarely rains for long periods, but the rainfall is spread throughout the year. There is no “rainy season” as what you would expect in countries closer to the equator. As you can see from the chart below, the amount of rain (precipitation) varies wildly across cities. The west coast received 4-5 times more rain than the east coast. As mentioned before in the article, New Zealand can have snow which is perfect for all the winter activities but can be also dangerous if you are not prepared. You can expect snow falling already in April, but it is more common from May onwards. There might be a few days here and there when the snowfall is heavy, but usually, the snow melts away pretty fast. Around June you will be seeing more snow in the mountains. Smaller roads might get closed for a period of time if the snowing is heavy and the snow ploughs have not had the time to clear. The roads might be icy and slippery in the early mornings, so take this into account when driving and estimating time to drive. In general, the south island tends to get more snow than North Island. If you are keen on winter sports, August is the best time for skiing and other activities. Juha is the chief bird at Kiwi Directory.